Whether you’re drinking a lager, a saison, or a sour, a truly great summer beer is usually characterized by its crispness, cleanness, and how refreshing it is. In other words, it’s easy-drinking. The kids call it "crushable." And by "kids," we mean brewers of completely legal age. In the greater DC area, these brewers are producing a wide variety of beers perfect for the year’s warmest months. We’ve rounded up the best of them below. Port City’s Derecho Common is the product of divine intervention. Four summers ago, the Alexandria operation was brewing a batch of pilsner when a quick and violent storm knocked out its electricity for five days. Like most lagers, pilsners ferment at cool temperatures, so without power -- and in the middle of a heat wave -- Port City was in a bind. In response, head brewer Jonathan Reeves decided to improvise and turn the beer into a California common. Historically known as "steam beer," this distinctly American style combines a lager yeast strain with an ale’s shorter, warmer fermentation, resulting in a crisp but fruity beer. California common isn’t what Reeves had set out to make, but it’s what he ended up with. As far as origin stories go, it’s a good one. 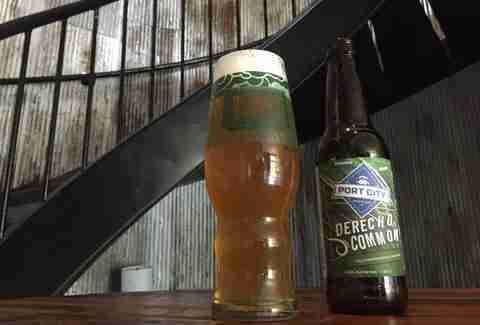 But what’s most notable about Derecho Common is how every summer since, Port City has not only reproduced the beer, they’ve actually made it better. Part of that comes from the foresight of planning to make a California common, of course. A bigger part, though, is that Reeves is a perfectionist, and he’s steered Derecho Common to a marvelous place. Exclusively hopped with Centennial, this year’s iteration has a distinctly citrusy and slightly spicy finish. Its golden body is fuller than it looks, too. Ultimately, Derecho Common will please hopheads in search of lighter fare, and lager fans that want to walk on the wild side. There’s plenty of room in its big tent -- weather permitting. The beers of Atlas Brew Works often feel guided by an old adage: "Keep it simple, stupid." 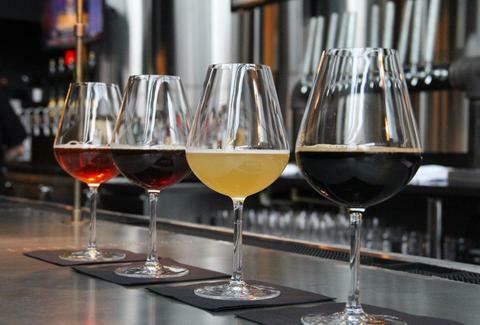 From their Rowdy rye ale to the 1500 South Cap Lager, the Ivy City brewery’s beers are a testament to the complex flavors that can be drawn from simple malts, hops, and yeast. Home Rule, a spring and summer seasonal, might be the embodiment of that approach. One malt. One hop. House yeast strain. That’s it. Adjuncts need not apply. Home Rule is also a great example of the India pale lager, an emerging style that combines a lager’s yeast and fermentation with the generous hopping of an American IPA. The best of these cross-pollinated brews are light and crisp (like a lager), with fruity aromas and flavors (like an IPA). That’s certainly the case with Home Rule, which uses Pilsner malt to spotlight New Zealand’s tart, citrusy Waimea hops. Be warned, though: it’s a deceptively smooth beer for 5.8% ABV. Two years ago, Nathan Zeender noticed cans of imported Radler popping up around DC bars. The German shandy, usually an even mix of beer and sparkling lemonade, can be refreshing in the summer heat. So the Right Proper head brewer decided to have some fun with the style: working with longtime friend, former homebrewing partner, and current beer scholar Mike Tonsmeire, Zeender developed his own Radler -- or something like it -- called Kodachrome Dream(ing). Named after the bright colors drawn from old Kodachrome 64 film, Kodachrome Dream(ing) is a lean, funky saison brewed with a good bit of wheat. It’s fermented with Right Proper’s house wild yeast (a combination of two Brett strains, two Saison strains, and some Lactobacillus), plus the zest from grapefruit, lemon, and lime peels. To further drive home those citrusy flavors and aromas, Right Proper dry-hops the beer with Citra and Galaxy. They call the unfiltered, slightly acidic beer a "Farmhouse Radler," but Zeender admits that’s a playful stretch. After being limited to Right Proper’s brewpub in past summers, Kodachrome Dream(ing) sees a full distribution this week. Zeender says the release is intended to sync up with the start of the Tour de France. "Radler," after all, is German for "cyclist." Most summer seasonals are strategically limited to the year’s warmest months. In other words, there’s nothing stopping a brewery from producing a wheat IPA in December. But who wants a wheat IPA when it’s 10 degrees out? In some instances, though, a beer can only be brewed for the summer. 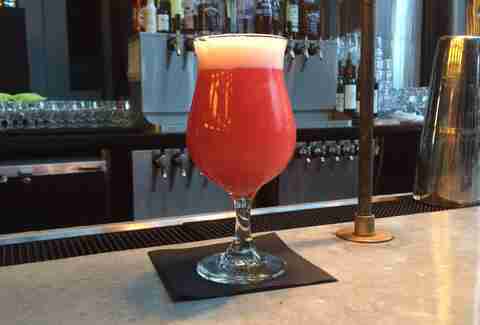 Such is the case with The Jam, Bluejacket’s strawberry-rhubarb Berliner weisse. The Navy Yard operation makes its sour wheat ale with locally grown produce, and since strawberry season only runs from late May to late June, that means the window to produce it is fairly narrow. But Bluejacket makes it count: this year, head brewer Josh Chapman and beer director Greg Engert sourced a whopping 750lbs of strawberries from Pennsylvania and Virginia. Due to an unusually cool growing season, those strawberries were especially tart, which meant Bluejacket was able to use more of the fruit than usual without masking the tartness from the lactobacillus-produced acidity and the 40lbs of Delaware rhubarb used in the boil. It’s an intensive beer to make -- some poor soul has to puree all of that strawberry -- but the end product is incredibly easy to drink: bright, quenching, and zesty on a warm afternoon. There’s no two ways about it: Kevin Blodger is the DMV’s master of gose. Union's head brewer has been producing a version of the tart German wheat beer since 2009, when he was still working at Chicago’s Gordon Biersch. Granted, the style itself dates back to the Middle Ages, but Blodger was well ahead of the recent spike in gose production that’s swept through American craft brewing. 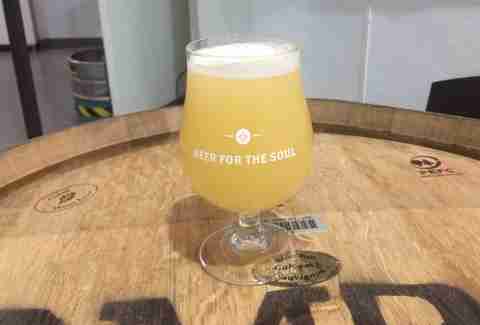 Since then, he’s perfected the art of kettle souring -- the method of using lactobacillus bacterium to impart clean, light tartness into a beer. This year, he’s flexed those skills with soured twists on a Vienna lager and a session ale, but Old Pro remains his masterpiece. Whether you’re well-versed in the style or not, Old Pro is a wonder: an effervescent, refreshing beer with a touch of salt and a tangy lemon finish. There aren’t many other goses that keep the average drinker coming back for another sip, let alone a second glass, but Old Pro does. In fact, when Union put the beer in cans for the first time last May, the brewery figured its order of aluminum receptacles would last them a few years. The reality: the brewery blew through them all before the end of that summer. Despite Old Pro’s massive following, Union is keeping the beer a summer seasonal, so snag a six pack and pucker up while you can. When Hellbender launched a little over a year and a half ago, it envisioned Southern Torrent Saison as a summer seasonal, and it’s not hard to see why. Like most of the DC brewery’s offerings, the Farmhouse ale is dry, thirst-quenching, and only moderately boozy -- all of the qualities you’d want in a patio sipper. But there’s a ton of flavor packed into that light body. Head brewer Ben Evans ferments the beer at unusually low temperatures using Hellbender’s rustic house yeast strain, a combination that lends Southern Torrent Saison floral and funky aromas, with notes of mild fruitiness and spice, making it arguably the area’s finest saison. 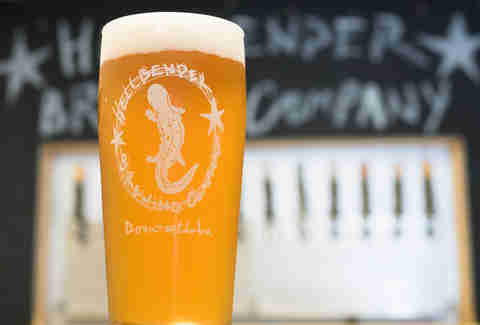 Unsurprisingly, Southern Torrent Saison quickly became Hellbender’s best-selling beer, too. This spring, the brewery wisely decided to make it a flagship. Now you can drink the beer in whatever season you’d like, but make no mistake: Southern Torrent Saison pairs perfectly with summer. Baltimore’s Union Craft didn’t want to make one IPA, so it made three. The twist? It releases each seasonally, with malt and hop profiles that complement the weather. That means a red IPA when the leaves turn a similar shade, a rye IPA to warm the winter chill, and Steady Eddie for the year’s longest, hottest days. Inspired by 3 Floyd’s Gumballhead, Steady Eddie is a hoppy wheat ale that’s delightfully hard to pin down. Wheat and honey malts give the slightly hazy beer a light, crisp base. Its hop profile, meanwhile, is distinctive without being overwhelming: there’s Green Bullet for bittering and Azacca for a touch of tropical fruit, but the star of the show is Sorichi Ace, which imbues the beer with a burst of herbal and lemon qualities. At 7% ABV and 80 IBU, the spring and summer seasonal is definitely an IPA, but it tastes different than any IPA produced locally. More importantly, you’ll have no trouble throwing back a few on a sunny day at the ballpark. Ironically enough, Union times Steady Eddie’s release to coincide with baseball’s opening day. DC Brau long ago cemented their reputation as the District’s resident hopheads. From The Corruption, a Northwest IPA, to the coveted On the Wings of Armageddon, an Imperial, brewmaster Jeff Hancock’s touch with Humulus lupulus is unimpeachable. Whether they're working on a winter seasonal or a one-time collaboration, Hancock and his team love making unabashedly hop-forward brews. "It’s always a good time for a double IPA," co-founder Brandon Skall once told me. "It’s like Champagne." Of all these sparkling beverages, perhaps DC Brau’s most anticipated arrives each summer solstice. In years past, it was called Solar Abyss; now it’s been rechristened as Space Reaper. Whatever the name, the 9.2% double IPA is a favorite both in and outside of the brewery. With a slightly sweet but unobtrusive malt bill, the orange-copper beer serves as a showcase for its single hop, Mosaic. Mosaic can produce a complex patchwork of flavors -- hence the name -- but DC Brau and its three-tiered dry-hopping technique draws out notes of strawberry coupled with a dank pineness. 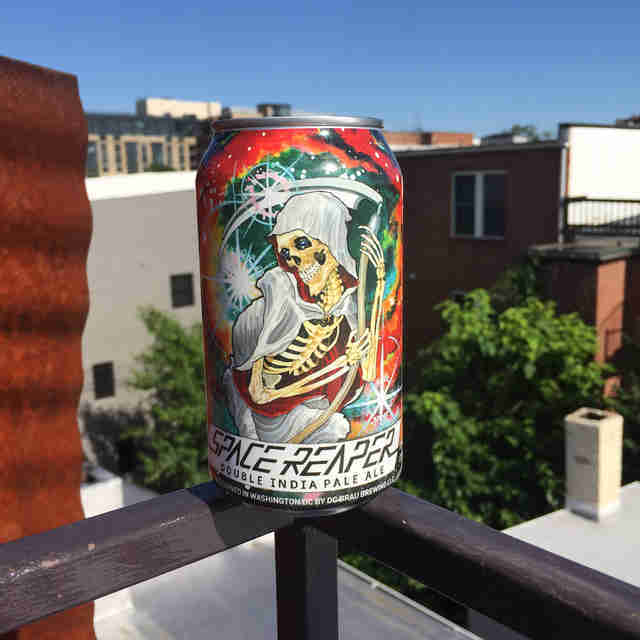 While such a rich beer isn’t exactly what you’ll want to pack for a picnic, it only arrives once a year, so don’t fear the Space Reaper; snag it while you can. Philip Runco talks to people who make beer and music. A lot of these conversations end up on BYT. He's patiently awaiting the Ocelot/Bluejacket collaboration IPA and a new Bill Callahan LP. Follow him on Twitter @PhilRunco, on Instagram @prunco, and on Untappd @prunco.